The Coffee and Crochet Group hatched from a short “Learn to Crochet” course set up at the National Waterways Museum by Cheshire West College in the autumn of 2009. The Group was a joint winner, with West Cheshire College, of The Waterways Trust Renaissance Award in the education category in May 2011, and the members continue to learn new ideas and techniques when they meet. They have made items for several local and national charities as well as for the museum shop but had never worked on a single project as a group. Building on the patchwork meadow idea of 6in square ’tiles’, an 8ft x 4ft panel to celebrate the narrowboat Friendship was designed, inspired by the traditional paintwork done by Tony Lewery. Rose Skinner was an accomplished crochet craftswoman and examples of her work were available to copy. It is a major exhibit, visitors can get up close to look at the whole boat and see the paintwork in detail. It was easy to take photographs to help with the design work. 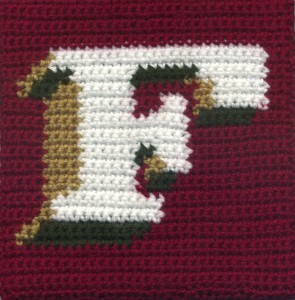 A very important part of the Coffee and Crochet Group is the friendship, caring and support between members, so to use this boat and to be able to call the project FRIENDSHIP is most appropriate. 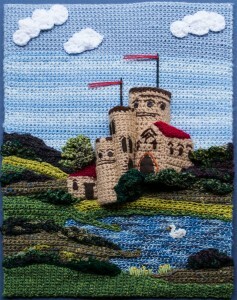 The panel is on display upstairs in the Island Warehouse where you can appreciate the 3-dimensional castles and roses.